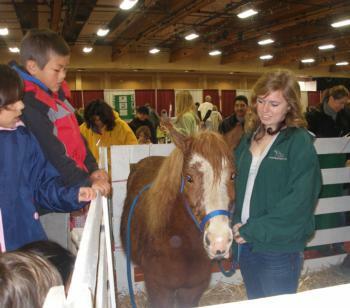 Farm Day is a free annual event held in March at the Marin Center Exhibition Hall in San Rafael. This event provides hands-on educational experiences outside the classroom for over 1,000 school children. Over 30 Northern California ranchers, growers, producers and educators provide interactive exhibits on agriculture, health, farm animals, gardens and environmental education. The event is made possible by the collaborative efforts of the following agencies: Marin Center/Marin County Fair, Marin County Farm Bureau, Marin County Office of Education, Marin Community Farmers Market Association, North Bay Dairy Women, Agricultural Institute of Marin, Marin County Weights and Measures, and the University of California Cooperative Extension Service/Master Gardener/4-H Programs. Marin Master Gardeners - "The Compost Cycle"